Are you looking to do something about your outdated bathroom vanity but don't have the time and money to get a new one? Well, there are actually many quick and simple fixes that you can do to change the look of the piece. For a simple makeover that can completely alter your bathroom vanity's appearance, try changing the current cabinet hardware. Removing and installing new hardware can take as little as an hour and the cost is very inexpensive as well. A cabinet pull or knob can run anywhere from $1 to $200 with a variety of designs, so finding the right fixtures should be a breeze. By changing your bathroom vanity's hardware, you can easily transition your furniture from one style to the next. Are you going for that ultra-luxurious Victorian-style look in your bathroom? 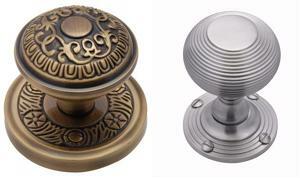 Opt for hardware in brass or bronze with ornate detailing. For a more contemporary look, choose simpler pieces in stainless steel or brushed metal for bathroom vanity that's masculine but still ultra-chic.